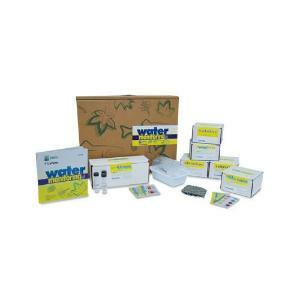 Most factors can be tested 100 times each with the Comprehensive Water Monitoring Kit. Using TesTabs, which are safe, nonhazardous reagent tablets, students can easily test for a variety of factors without risk. Developed by the Global Rivers Environmental Education Network, each monitoring kit comes with a bilingual (English and Spanish) manual. The kit include enough TesTabs to test nine factors. Test factors include benthic macroinvertebrates, biochemical oxygen demand, coliform bacteria, nitrate, dissolved oxygen, pH, phosphate, turbidity, and temperature change. The kit have enough material for 100 tests each (44 coliform tests; unlimited benthic invertebrate, turbidity, and temperature change tests).